One of the best Napa wine tours I ever attended ended the winery visit with not only samples of their cellars, but with foods paired with the wines. I will never forget how deliciously a sauvignon blanc pairs with bruschetta, or how lovely a dessert wine tastes with shortbread and strawberries. I am not a fan of sweeter wines, but a well made dessert wine can be heavenly. Even if you are a die-hard dry red lover like me, I bet you can find a dessert wine that you like, too. The Husband is not too fond of sweet wines, but he had no choice. 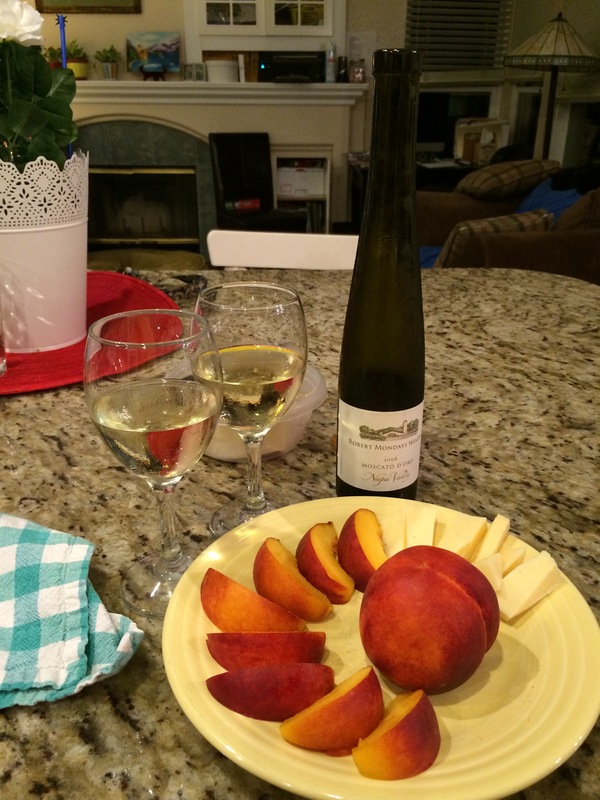 I made him try a Moscato D’Oro from Robert Mondavi Winery, along with a Mahón cheese and fresh peaches. Fresh peaches… aahhhh… is there any fruit better than tree ripened fresh peaches? I practically turn orange this time of year from eating so many peaches. If I don’t keep The Boy out of the most recent box, I won’t have enough to make another cobbler. I better hide them. The Husband had no complaints about the wine. If he did, I would hide the next cobbler from him. I fight dirty. He didn’t care for the cheese pairing but nonetheless, we still ate all the cheese. I loved the fruity flavors of this wine- such rich peach and berry flavors. Maybe I’ll make that cobbler tomorrow and we will finish off the wine tomorrow. It has been over twenty years since I’ve had a dessert wine, so I am counting this as something new. The last time was that Napa trip, our honeymoon. Thanks for being my wine buddy tonight, sweetie! Previous Previous post: Coconut Porter to Inebriate a Virus? Don’t Mind If I Do! Next Next post: Little Personal/Family Victories… yea!